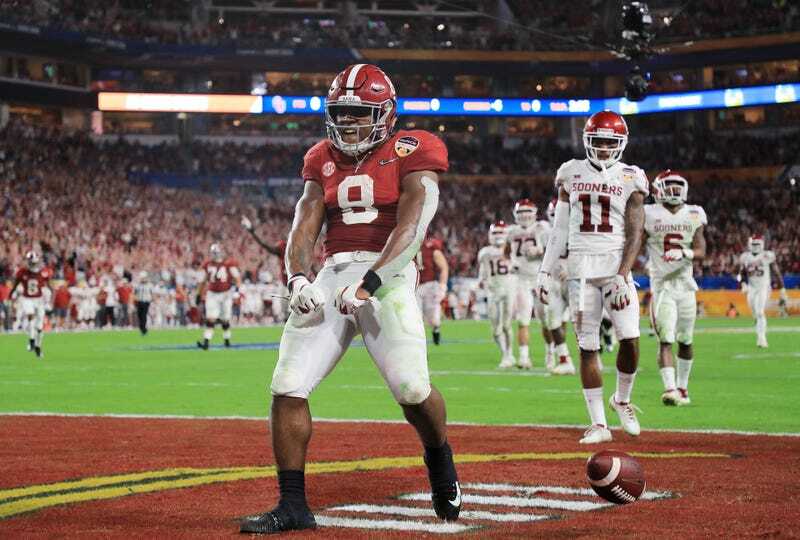 In Saturday’s first 17 minutes of game time, Alabama reeled off 28 straight points to knock down Oklahoma before anyone at the Orange Bowl had a chance to buy a second beer. That early lead proved to be the cushion Alabama needed to coast to an easy, if not entirely calm, victory in Miami. The final score flatters the Sooners a bit, since the Crimson Tide ended up winning by only 11 points, with a final score of 45-34. The early barrage was a prime example of what Alabama does to pretty much anyone not named Georgia or Clemson; they hit fast and hard and jump out to huge leads before their opponents even get settled into the game. Oklahoma first made it interesting in the second quarter, with Heisman Trophy winner Kyler Murray driving the Sooners down the field for their first score, a two-yard scamper by Trey Sermon. Oklahoma would go on to tack on a field goal later in the quarter, though they also allowed Alabama to get a field goal of their own right before half. However, the Tide immediately responded with a crowd-quieting 75-yard touchdown drive, as quarterback Tua Tagovailoa picked apart the Oklahoma defense with his trademark precision passing. Oklahoma would close the lead to 11 twice more in the fourth quarter, but Alabama was ready for the Sooners’ surge, responding with a quick five play drive to push the score to 45-27, before running out the clock on the shoulders of star running back Josh Jacobs. As the fourth and final team to squeak into the semi-finals, Oklahoma faced questions about whether they belonged in the playoff over, say, Ohio State or Georgia. In a way, the Sooners were the perfect counterpart to Notre Dame: a big name that got by on reputation and brand name more than what they showed on the field. The semi-final matchup did help quiet those doubters a bit, though both games on Saturday will be used as prime evidence for those who want to expand the playoff format. On the other side, Alabama moves on to its upcoming National Championship bout with its most evenly matched rival of the past few years. Clemson will likely put up more of a fight than Alabama has seen all year—outside of the SEC Championship Game, that is. It took just over a quarter for Alabama to show the world that there is an elite tier leaving the rest of college football behind, and there is no room for Oklahoma at the top, despite their valiant efforts to climb back into the game in the second half. That’s why college football’s marquee matchup from the past half-decade will see its championship rubber match in California on Jan. 7, and the rest of us outside of Clemson and Tuscaloosa will just have to deal with it.